MOSFET RDSon temperature coefficient is positive. Meaning, it will increase with increasing temperature. 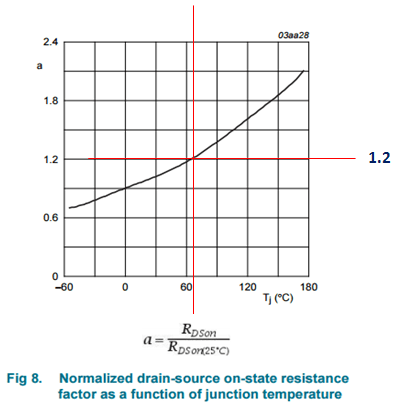 In this article I will discuss and interpret MOSFET RDSon temperature coefficient that is often given in the form of graph in datasheets like below. 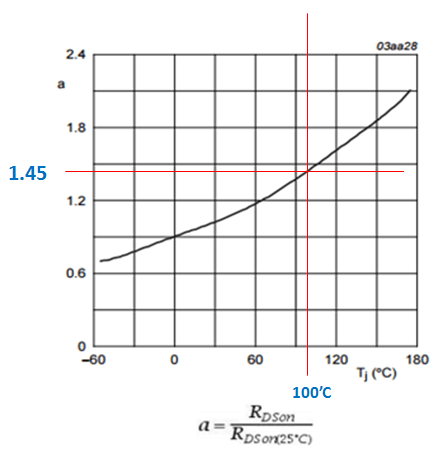 Datasheets may also provide actual RDSon data with respect to junction temperature instead of the coefficient like below. Datasheets also provides tabular data for MOSFET RDSon that is taken from specific points and conditions as below table. Most of the times, I use the information on the graph in my analysis since there I can see the RDSon value I wanted for a specific operating temperature. 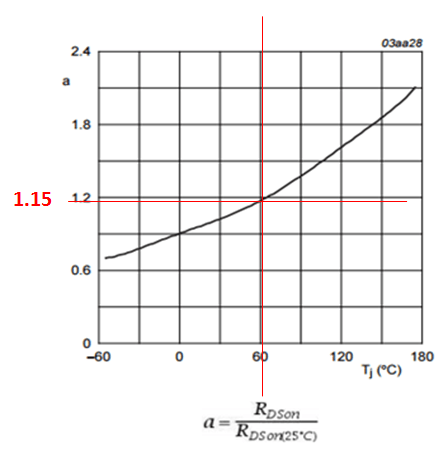 MOSFET RDSon temperature coefficient is often given in terms of graph. 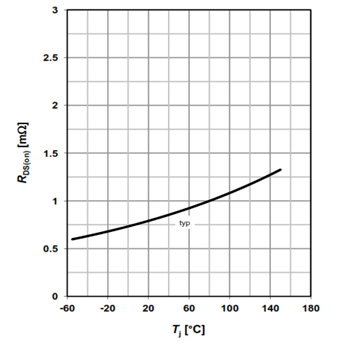 The graph indicates the MOSFET RDSon temperature coefficient (in the y-axis) and the junction temperature (in the x-axis). 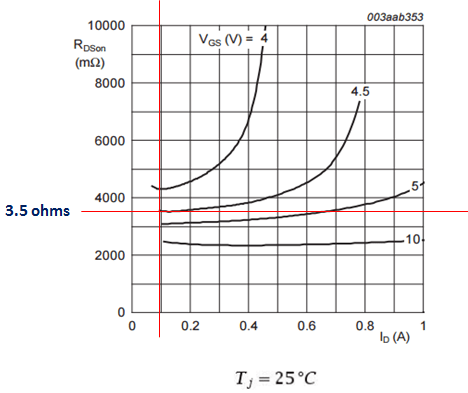 The data in the y-axis on the above graph is the multiplier to the typical RDSon that is taken usually at nominal junction temperature of 25’C. For instance, the expected maximum junction temperature of the MOSFET in normal operation is 60’C, the resulting MOSFET RDSon temperature coefficient is around 1.15. 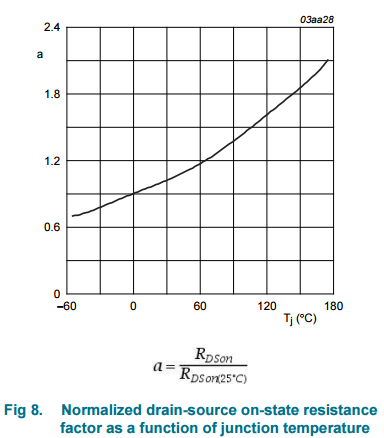 Then, how to use the MOSFET RDSon temperature coefficient derived above? Simple, whatever the specified typical MOSFET RDSon (which is normally taken at 25’C junction temperature), just multiplied it by the MOSFET RDSon temperature coefficient derived above. For example, the typical RDSon measured at 25’C junction temperature is 0.5 ohms, the corresponding RDSon of the MOSFET at 60’C junction temperature is 0.5 ohm X 1.15 = 0.575 ohm. Using the same MOSFET RDSon temperature coefficient above, determine the corresponding RDSon at 100’C junction temperature with a typical RDSon of 1 ohm. For 2N7002, at a drain current of 100A and VGS of 4.5V, the typical RDSon is 3.5 ohms. The value we got above is only valid for junction temperature of 25’C. Our target is to get the RDSon at 60’C ambient. The requirement is 100’C ambient but not junction temperature. 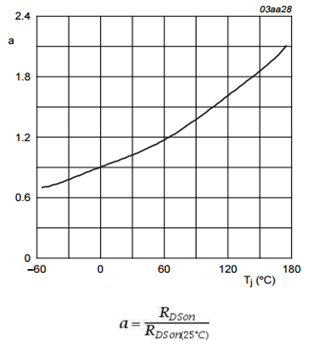 We must convert 60’C ambient temperature to junction temperature using below relation. So, for an ambient of 60’C, the equivalent junction temperature is 60’C+12.25’C = 72.25’C. The multiplier we need is 1.2 based from the graph below. For more detailed explanation particular to MOSFET RDSon determination, read the article How to Use MOSFET RDSon Data from the Datasheet.